When a storm rolls in, to me, it is a thing of fearful wonder. If I can, I like to watch it pass by, from a safe vantage point appreciate it’s power. To be in the midst of a storm, is another thing all together. During my early college years, I was driving in the Adirondacks when a strong thunderstorm hit. It was hard to see the lines before me, outside of the windshield being pelted by the torrential rain. Then there it was, a funnel cloud, descending just to the right of the road. My wonder was put on hold as I fearfully sped up to avoid being anywhere near that imminent destructive force. When God’s wrath rolls in, it is utterly terrifying. No safety is to be found if you’re the object of God’s wrath. This was the case for Edom, a nation with a violent relationship with their brother nation, Israel. The prophet Obadiah, received a message from God and delivered the message of their fate generations ago. Today, we’ll read the entirety of this shortest book in the Old testament, 21 verses, I’ll highlight the historical background and the we’ll wrestle the good wrath of God. The vision of Obadiah. Thus says the Lord GOD concerning Edom: We have heard a report from the LORD, and a messenger has been sent among the nations: “Rise up! Let us rise against her for battle!” Behold, I will make you small among the nations; you shall be utterly despised. The pride of your heart has deceived you, you who live in the clefts of the rock, in your lofty dwelling, who say in your heart, “Who will bring me down to the ground?” Though you soar aloft like the eagle, though your nest is set among the stars, from there I will bring you down, declares the LORD. If thieves came to you, if plunderers came by night— how you have been destroyed!— would they not steal only enough for themselves? If grape gatherers came to you, would they not leave gleanings? How Esau has been pillaged, his treasures sought out! All your allies have driven you to your border; those at peace with you have deceived you; they have prevailed against you; those who eat your bread have set a trap beneath you— you have no understanding. Will I not on that day, declares the LORD, destroy the wise men out of Edom, and understanding out of Mount Esau? And your mighty men shall be dismayed, O Teman, so that every man from Mount Esau will be cut off by slaughter. Because of the violence done to your brother Jacob, shame shall cover you, and you shall be cut off forever. On the day that you stood aloof, on the day that strangers carried off his wealth and foreigners entered his gates and cast lots for Jerusalem, you were like one of them. But do not gloat over the day of your brother in the day of his misfortune; do not rejoice over the people of Judah in the day of their ruin; do not boast in the day of distress. Do not enter the gate of my people in the day of their calamity; do not gloat over his disaster in the day of his calamity; do not loot his wealth in the day of his calamity. Do not stand at the crossroads to cut off his fugitives; do not hand over his survivors in the day of distress. But in Mount Zion there shall be those who escape, and it shall be holy, and the house of Jacob shall possess their own possessions. The house of Jacob shall be a fire, and the house of Joseph a flame, and the house of Esau stubble; they shall burn them and consume them, and there shall be no survivor for the house of Esau, for the LORD has spoken. Those of the Negeb shall possess Mount Esau, and those of the Shephelah shall possess the land of the Philistines; they shall possess the land of Ephraim and the land of Samaria, and Benjamin shall possess Gilead. The exiles of this host of the people of Israel shall possess the land of the Canaanites as far as Zarephath, and the exiles of Jerusalem who are in Sepharad shall possess the cities of the Negeb.Saviors shall go up to Mount Zion to rule Mount Esau, and the kingdom shall be the LORD’s. ~ The history in short begins with a family feud over birthright setting the stage for generations of animosity and ends with a nation being erased from the face of the earth. Gen_25:25 The first came out red, all his body like a hairy cloak, so they called his name Esau. Gen_36:1 These are the generations of Esau (that is, Edom). Esau gave up his birthright to stay alive, fulfilling only his temporary appetite. This birthright was a special gift from God but it was casually rejected! The disagreement led to the firstborn, Esau, wanting to kill his sinful brother. They eventually made up after Jacob sought forgiveness and went their separate ways to father nations. Num_20:20 But he said, “You shall not pass through.” And Edom came out against them with a large army and with a strong force. Num_20:21 Thus Edom refused to give Israel passage through his territory, so Israel turned away from him. Jdg_11:17 Israel then sent messengers to the king of Edom, saying, ‘Please let us pass through your land,’ but the king of Edom would not listen. And they sent also to the king of Moab, but he would not consent. So Israel remained at Kadesh. Num_24:18 Edom shall be dispossessed; Seir also, his enemies, shall be dispossessed. Israel is doing valiantly. 2Sa_8:14 Then he put garrisons in Edom; throughout all Edom he put garrisons, and all the Edomites became David’s servants. And the LORD gave victory to David wherever he went. 1Ki_9:26 King Solomon built a fleet of ships at Ezion-geber, which is near Eloth on the shore of the Red Sea, in the land of Edom. 1Ki_11:14 And the LORD raised up an adversary against Solomon, Hadad the Edomite. He was of the royal house in Edom. 2Ki_8:20 In his days Edom revolted from the rule of Judah and set up a king of their own. The relationship between these nations reached a despairing point, when Israel was being invaded, Edom actively cheered and participated in the rounding up of and murdering those trying to escape from invaders. This is not a passage, I’d feel comfortable sharing on Facebook. The imagery is intense! Such were the feelings of this oppressed people longing for a return to their homeland. They would not forget Edom’s wicked actions nor would their God. Edom was regularly against God’s people, Israel. Their day of judgement was coming. ~ To summarize Edom’s sins, they were a proud people that took advantage of the weak. All your allies have driven you to your border; those at peace with you have deceived you; they have prevailed against you; those who eat your bread have set a trap beneath you— you have no understanding. Will I not on that day, declares the LORD, destroy the wise menout of Edom, and understanding out of Mount Esau? And your mighty men shall be dismayed, O Teman, so that every man from Mount Esau will be cut off by slaughter. Because of the violence done to your brother Jacob, shame shall cover you, and you shall be cut off forever.On the day that you stood aloof, on the day that strangers carried off his wealth and foreigners entered his gates and cast lots for Jerusalem, you were like one of them. The Proud are humbled, The Rich are shown to be poor, The Wise are shown to be fools, The Strong are shown to be weak. God sets things right with a process that turns upside down the thoughts and ways of mankind. The prophet next warns others to be careful of their own heart – Check yourself that you do not follow the pattern of Edom! Repentance? Grace? Mercy? Where are those qualities, we find comfortable about God? They are not found here for Edom. His love calls for justice, His goodness pours out in judgement against a wicked people. This evil no longer exists in the wake of God’s wrath. This good wrath of God can be hard to accept. I reminds me of a artwork, an iconic wood block print, made by a Japanese artist, portraying a giant foamy wave overshadowing Mount Fuji The Great Wave off Kanagawa In the perspective, of it’s viewer, the mountain seems it will be consumed by the wave. In reality, we know a mountain remains unchanging and a wave returns to the sea. So it is with the judgment of God. A perspective in modern thinking can shadow the goodness of God, like the wave to the mountain. But God remains unchanging in his goodness, it is us who need a changed of perspective if we cannot accept God’s ways in the world. Time ran out to repent and accept the good gifts of grace and mercy that God may have had for Edom. It will one day run out too for the rest of the nations as the prophets reminds, so mind your deeds and be patient child of God. Our time is limited to live in God’s ways. All intents and actions will be judged one day by Him. The chosen return, you will not! God was reorganizing borders and eliminating Edom from national existence. The Origin: Esau gave up his inheritance to feed his appetite. As the firstborn, Esau, sought to kill his sinful brother. Consider this: Jesus gave up his life to gain His inheritance. Col 1:23 if indeed you continue in the faith, stable and steadfast, not shifting from the hope of the gospel that you heard, which has been proclaimed in all creation under heaven, and of which I, Paul, became a minister. As the firstborn of all creation, Jesus, chose to die for you to make you his brother. The Proud are humbled, The Rich are shown to be poor, The Wise are shown to be fools, The Strong are shown to be weak. As one’s who have actively offended God ourselves, repentance is the path opposite of Edom and the ways of this World. Being exalted in God, Being rewarded with the rich righteousness of Christ, Gaining wisdom from above and being strengthened in the midst of your weakness. Edom was regularly against God’s people, Israel. Their day of judgement was set. This world is regularly against God’s people, the church. It’s day of judgment is coming too. Wait patiently for God’s judgement but don’t rejoice in it for the wicked, mourn for them. Rev 20:11 Then I saw a great white throne and him who was seated on it. From his presence earth and sky fled away, and no place was found for them. Rev 20:12 And I saw the dead, great and small, standing before the throne, and books were opened. Then another book was opened, which is the book of life. And the dead were judged by what was written in the books, according to what they had done. To be immersed in liquid fire is one of the most painful pictures God uses, so we can try to understand what it feels like to be completely separated from Him. This is the prophetic end for those not in the book of life. The phrase “Red Alert” comes from the naval tradition of “General Quarters” (“Action Stations” if you’re British), where a ship prepares for battle. Much of the procedures are the same. The alert is sounded by a drum or over an intercom. Off-duty sailors report to their stations, cannons are loaded, and the decks are cleared of non-essential items. bright red warning lights! God’s love powers these flashing red lights of prophetic doom. Don’t ignore them for a temporary peace of mind, when peace with God is on the line. If you find yourself, in your own ways of operating, proud of self, rich in self, wise in self and strong in self, this is what God calls sin. This may be one of your last chances to turn away from it. Repent today of your own sinful ways, your own self-righteous and accept the only escape from the judgement to come, Jesus Christ. Jesus Christ, the son of God, was send by the Father to pay the penalty for your sin, he is an eternal umbrella from the torrential storm of God’s wrath that is reserved for sinners. Believe he is the one who can save you and submit your will to his own. You are now saved from destruction and can pray with God’s people like this. 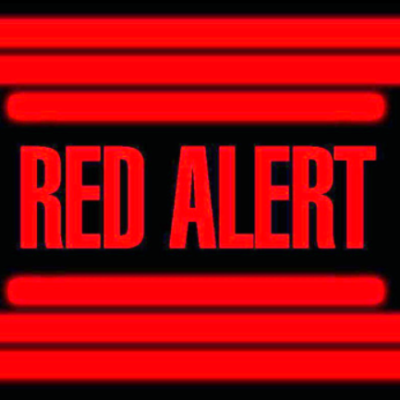 If you are a Christ-follower, saved from wrath by the grace of Jesus Christ, the klaxon you hear is not the ‘red alert’ of your impending doom but a call to “all hands on deck” to save those around the imminent destruction. You are tethered to the ship that is Christ, so do your best to live, speak the life-preserver of good news of Jesus Christ to rescue those around you.